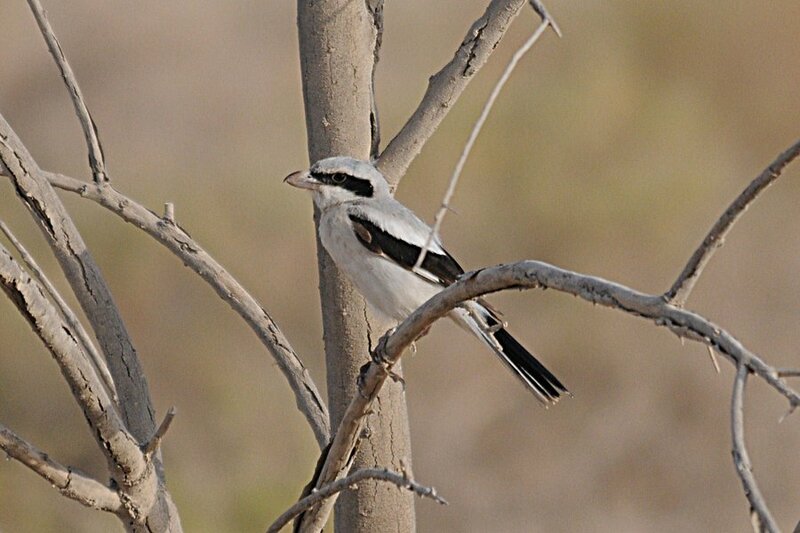 Sabkhat Al Fasl is probably the best birding site in the Eastern Province and it is good at attracting shrikes of various species. 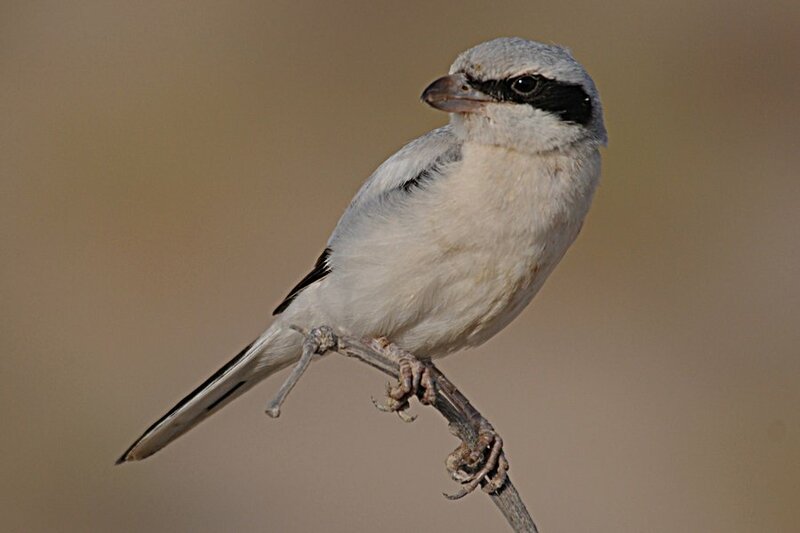 The commonest shrikes here through the year are Daurian Shrike, but Mauryan (Steppe) Grey Shrike Lanius m pallidirostris also occurs in small numbers. 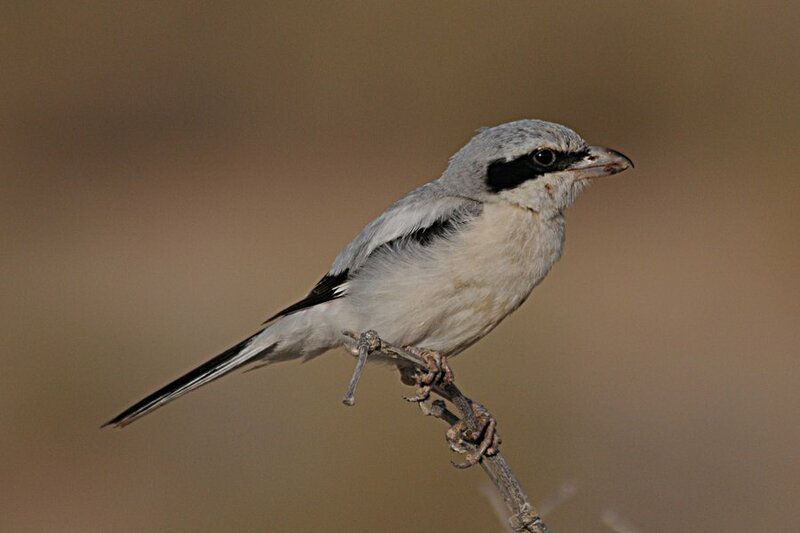 This year it is the first returning shrike with one at Dhahran Camp during the week and another at Sabkhat. This bird was seen very early in the morning and was very obliging which is unusual for this species. One interesting thing about this shrike is the amount of black extending over the bill area with this meant to be a feature of Southern Gry Shrike. 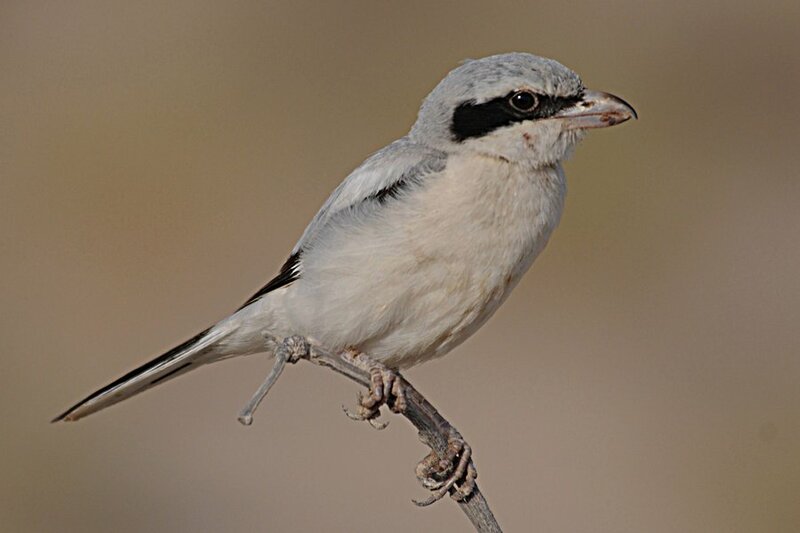 The shrikes out here in the Eastern Province of Saudi Arabia are very complex and need further study as much is not known about them. The pale bill and large primary patch is typical of Steppe Grey Shrike and the wing and tail pattern of the bird in flight was also typical. Most drawings of the species show young birds with pale lores, bit many birds out here are adults with dark lores. 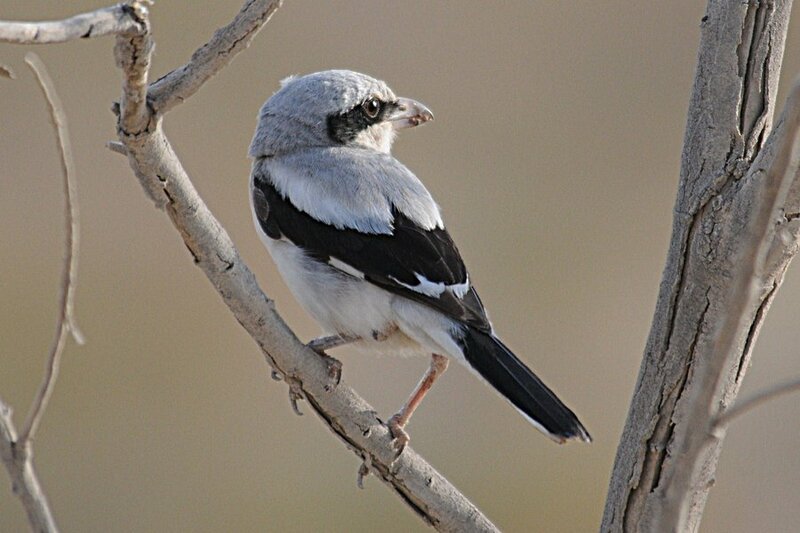 The bills on some adults can also be black, although this is rare, resembling Southern Grey shrike even more. Cracking set of pictures Jem. Nice shots - there must be individual variation with the lores/bill etc. I would have thought the overall mantle colour would be a reasonably constant feature? Altho in your strong lighting conditions even darker mantled forms will look 'washed out' sometimes. I wish i lived in an area where i had this sort of problem! 1- the bill is deeper based typical of Eastern province birds. Pallidirostris never such a deep based bill. 2- The lore is too dark for pallidirostris, which would show a slightly paler than most of the mask. 3- The mask extends over the bill a typical character of aucheri. 4- The sooty black on the wings is a character of aucheri than pallidirostris. 5- The amount of black on the wings extending over to the bend of wing is more typical on aucheri. The paleness of the bill is a feature of aucheri in summer time although juveniles have even paler bills. A bird appearing in early July is more likely to be of the resident species i.e aucheri rather than pallidirostris as the latter usually arrives in our area by mid-August, and some arrive by early August. Thanks very much for your comments. This bird was an interesing one and one I checked with Andrea Corso in Italy who has studied pallidirostris and aucheri extensively. He thinks the bird is a pallidirostris and has photos of birds taken from museum collections of pallidirostris looking like this. The bird in flight also looks like a pallidirostris and there does not appear to be enough white in the secondaries for pallidirostris to my eyes. Andrea mentioned 'the bird is a 2nd cy so I do not find odd to see adult or advanced 2CY pallidirostris with fully or partially dark lores.... some adult have even a fully dark bill oddly enough but indeed I've seen some of those. 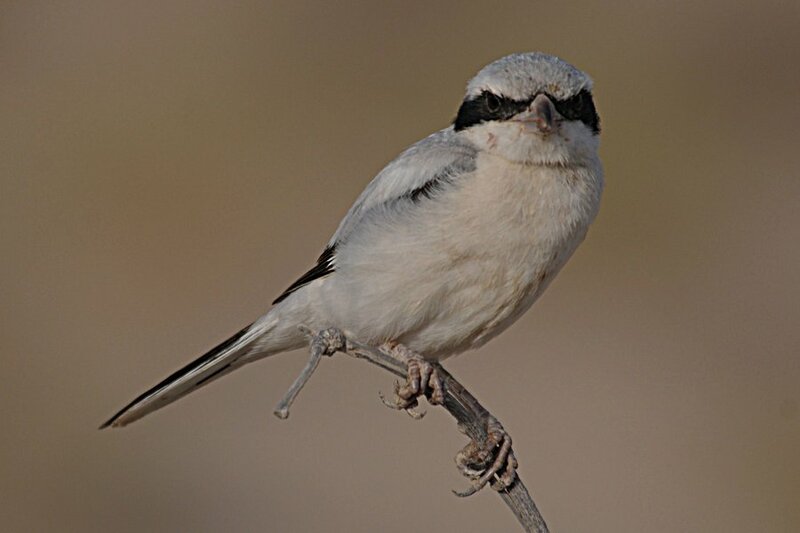 The bird seems to be a Steppe Grey Shrike but to be sure in your area and N Africa I would be always more happy when I could check secondary pattern on very well spread wings...however, primary projection seems to be long enough to eliminate the other similar taxa. Does adult or 2nd cy aucheri have a pale bill like this? my understanding is they do not although I have a lot to learn on these birds as they are probably the most difficult species / subspecies we have in our area. Some ringing data on them would be more than valuable if we could get some. The shrikes in this part of the world and very complex and many have features fitting more than one subspecies as they are clinal in nature. Andrea is going to write a paper on these birds in the near future and it will be interesting to see what he has to say.